Jerome -- Our trip with Tao was one of the things I was one of the things I was most looking forward to in our trip. 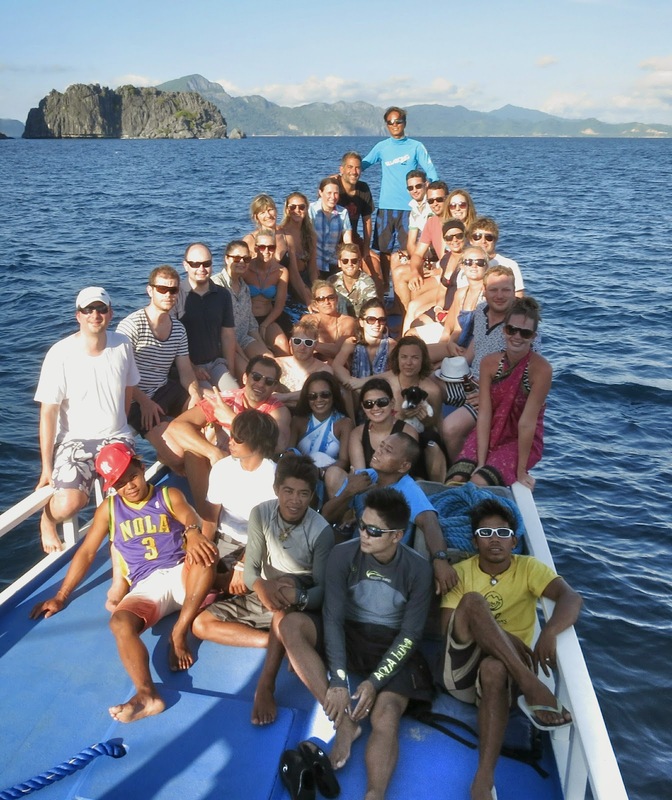 They do small "expeditions" between Coron and El Nido, stopping at basecamps they've setup throughout the nearby islands. Tao does a lot of great work with the local communities - they were one of the first responders to deliver supplies to some of the outlying areas when Typhoon Yolanda (Haiyan) hit. They also try to work with, employ, and train the local communities in the area, and at their main camp, they've set up an organic farm and are working on a womens' center and an academy to provide ongoing education. Our expedition route over the five days. Not pre-determined, but filled out as we went. I was a bit surprised to find out that they're actually quite big - they have about 10 boats out on expeditions every week! These range in size from private groups of a few people to large boats (like the one we were on) with 25 guests, 7 crew, Tiger, the crew dog, and Stephanie, the incredibly cute crew puppy. The guests on our boat were from all around the world - several Aussies, a couple Brits, Germans, Austrians, and Swedes -- surprisingly no Americans! Ollie was the enthusiastic leader of our group. Ollie is a native of Coron and has been working at Tao since very early on (over 7 years I believe). We embarked early in the morning and made several snorkeling stops the first day: a shallow wreck (that we had previously scuba dived at), a great reef, a sunken amphibious landing craft, etc. Lunch was fried fish, rice, vegetables. Coffee and ginger tea and drinking water were always on hand. All this was really good, but I think our first basecamp really blew me away. We arrived at around 4:30 to a beach shaded by tall coconut trees. Our "beds" were open-air frames with thatched roofs, directly between the trees (they'd later set up mattresses, pillows and mosquito nets in these). The whole area had been pretty carefully tidied and raked recently, we could easily walk barefoot without twigs or rocks poking our feet. Showers at this camp were just a bucket with fresh water (and bathroom is a toilet with a bucket to flush), but it was good enough! Chef Jeff (and Francis, the assistant chef) did an awesome job preparing our dinners - Grouper and Jack fish roasted over the fire, rice, vegetables. We also had cold beer (brough with us on the boat) and rum! A great feast! The typical spread for lunch with Tao! After dinner I explored the shallow water with my headlamp on - lots of crabs, hermit crabs and starfish. I also found out that the water is full of bioluminescent plankton - kicking the water causes it to light up as if sparks are coming out of your feet! Laura was particularly drawn to the stars - I guess there isn't too much light pollution on those remote islands because the stars were super bright. We were able to identify Mars, Jupiter, and many of the constellations. Bed was little warm, since there wasn't much breeze, but it was comfortable and it was nice that it was so open to the air. We slept well after all that snorkelling! - Have breakfast: eggs, rice, fruit, coffee/tea, etc..
- We were travelling on my birthday and we happened on be on an island were there was a karaoke machine. It seemed really bizzare to be out in the middle of nowhere, singing Wonderwall and Sweet Caroline - but it was a lot of fun! I stuck to beer, but I must say that a LOT of rum was consumed that night! - We stopped at one site were there was some great cliff-jumping. After scampering up some rocks, you could jump into the deep water. I jumped a couple times, Laura decided to abstain and film it all instead. - At one snorkelling site I found an area where the bottom was littered with dead fish (hundreds of them). Ollie was pretty sure that someone had recently done some dynamite fishing in the area (which is illegal) which had killed all those fish. Such a shame. We gathered some of them, which I think Ollie gave to the villagers at our next camp. - Ollie was super-excited to have us try Tamilok. Tamilok is a worm that lives in the wood of dead mangroves and is eaten raw! He split several logs to harvest the worms, cleaned the worms. He eneded up deciding not to share (much to the relief of most of us) because the worms were too small and had a bit of sharp "wasabi" flavor. I was secretly a bit excited to try -- but not excited enough to order myself a plate when I saw them on a menu a few days later. Ollie gathering the tamilok from a mangrove branch. Ollie sampling one of the tamilok! - We made a bunch of friends (some 4-legged), including with some of the crew! We've got most people's email addresses and I'm sure they're all eager to read the following story. Laura -- Wednesday afternoon, after lunch, almost everyone was passing out for a nap. Partly due to the heat and activity, and perhaps a little bit due to the karaoke party the night before. Jerome and I were feeling fine though, and decided to snorkel after hearing the reef around this deserted island - Cobra Island (officially Manlihan Island) - was pretty good. We checked that the boat would be staying for a while, and went out swimming with our fins, snorkels, water shoes and rashguards on. As always I kept an eye on the boat, to make sure we didn't stray to far. We saw looks of really neat coral, and some interesting fish. About 45 minutes later I looked up to check the boat, and it wasn't where I thought it should be. I called Jerome, and we swam a few metres, and then could see see it fine. We thought we'd just gotten turned around a bit, but having checked my watch, decided we should head back to the boat. The beach where the boat was parked was very distinct - with 5 big rocks just in front. We swam to the rocks, and realized the boat wasn't there. It had moved! We could still see it, but it was across the way at the next island over. We swam to the desserted beach to try and figure out what was going on. We were sure we were in the right place, but the boat was now quite a ways away. I said that we should swim to it, to make sure we got to it. Jerome wasn't sure, but agreed to at least try. We swam for a short while, but then hit a big drop off, where we could no longer see the bottom, and it looked like there might be current. So back to shore we went. We decided the boat perhaps just went there and would come back for us when they were done there, or if they had left without us, they'd surely do a count, and then come and get us. Jerome reminded me that we'd be much more visible on an empty white beach, than bobbing in the water, and we could still see the boat, so everything was fine. It was 2:30pm at this time. We found a small patch of shade, and sat for about an hour watching the boat anchored at the other island. We could see people walking around on deck, so were sure, they'd see us when they went to leave. At about 3:30pm, we heard the boats engine start, and saw it start to take off, it turned right towards us. "hooray, they've realized and are coming to get us" I thought. We had put Jerome's rashguard on an 8ft stick we found, I was waving it from the beach while he stood on one of the big rocks waving. Surely this was overkill, but we wanted to be sure they saw us. Then the boat turned, and started to go past the island. I started to panic and ran down the beach, following its path, waving my arms and yelling as loud as I could. Jerome was behind, having had to scramble down from the rock. And we were still waving and yelling and could see people on the boat walking around, as it passed the point of the island and went out of sight... I was devastated, angry and in disbelief! I just sat down in the water and started to cry a little bit. Jerome caught up, gave me a big hug, said not to worry, they'd be back soon. He said he'd go to the point to see if the boat was just around the corner, and sent me back to the beach area where our stuff was, to see if I could flag down another boat or find useful things. Having something to do, calmed me down, and I went back to the area, found some big sticks, made a flag of Jerome's shirt, waved at some fishing boats, tried to find something useful. About 4:30, Jerome was back, I'd waved to some boats, but had no luck in getting a response. Another was passing so we both waved for a while. We knew the sun set at about 6, so we started talking about what to do if they didn't come back right away. We knew the next part of the trip involved the boat crossing a large channel that would take at least an hour. We knew the base camp was on the other side, and that at the very least, when they handed out our bed sheet kits at camp they would figure out we weren't there. We guessed that might be about 6:30, so with coming back across the channel it would be 7:30 at the earliest. We also weren't sure the boat could come back at night, as we hadn't seen big lights or anything, so decided to plan on being there until morning. Jerome went to see what he could see inland, I tried to figure out how to make a fire. We had found some rope, so I made a small bow to attempt it, but having never done it before, was unsure of exactly how to do it, and after about an hour had no luck, and seeing the sun start to cross the horizon was feeling a bit hopeless. Jerome came back with some better news. He'd found a patch of coconut trees a short way away, with one shorter one that he thought he could get a coconut from. We grabbed the big bamboo stick we'd found, and headed towards it. The tree had foot rungs cut out, and Jerome had to climb up 2 to reach the coconut with the stick. We were both scared for him to go higher. But after some persuasion, the coconut fell to the ground. We marked where to get to the tree with the big stick on the beach so we could get back in the morning, and rushed back to the area we'd decided to use as our "camp" - a clear area of beach, with a big log on it. The light was almost all gone by now. Jerome rushed to the rock and found a piece of stone. The stone was brittle enough that it could be "sharpened" a bit by bashing it into the other stones. I gathered everything together by our log so we'd be able to find it if we needed it in the dark. By the very last light of day, we hacked away at the coconut with our rock until finally after much work, we got a small hole in the top! We took turns drinking the coconut water which tasted wonderful. After an hour swimming and 5 hours on the island in the hot sun, you can imagine we were a bit parched!! We attempted to get some meat from the coconut, but after a small piece each, realized it would make us thirstier than it was worth. 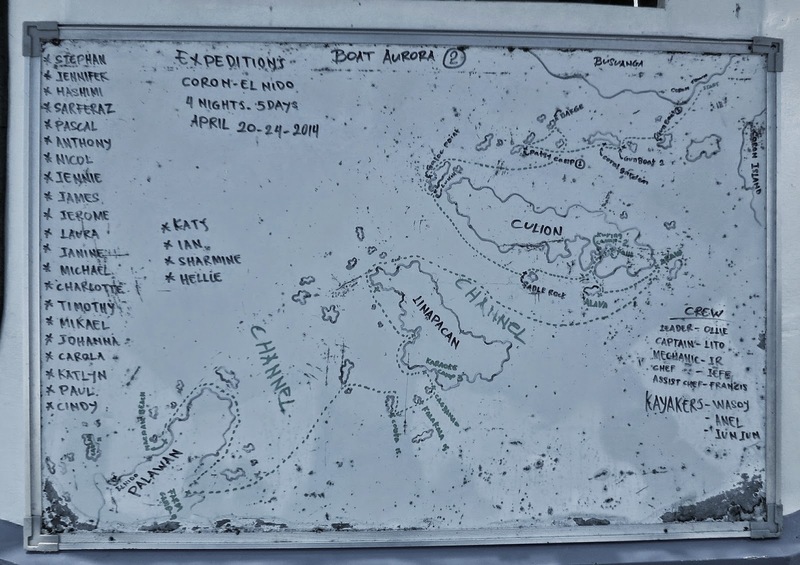 We decided that in the morning, first thing we'd do would be to leave a message at our camp in case the boat came, and try to get a bunch more coconuts, then we could eat ours, and have something to drink after. With the sun down, and no fire, light, water or food, we decided we should try and just sleep. It was about 7pm now. And we laid down by the log, looking up at the amazing stars. We could see where a few lights from houses in the distance which we noted for tomorrow. With night fall, the wind died down, so we tried yelling for help, and blowing the tiny whistle on my snorkel to try and alert someone to come get us, but didn't get any response.We couldn't sleep yet, so went over our plan, and tried to figure out what to do tomorrow if the boat didn't come right away, etc. We realized this wasn't helping us get into the mindset to sleep. So we decided to think on the positive, the beach was warm, there were no mosquitoes or bugs, they'd surely come in the morning. We saw about 4 shooting stars. We got all comfy to sleep and played a word game we used to play back in high school (name a band. name a band that starts with the last letter of than band's name. repeat back and forth). This lulled us to sleep, and I glanced at my watch one last time before falling asleep - 9pm. We woke up at 10pm, to the most unpleasant feeling, big cold wet rain drops on our back as it started to rain. This was something we hadn't foreseen, or considered. We ran to the small bushes where we'd sheltered from the sun. Not perfect, but better than being out. The rain was quite cool, and despite trying to wedge ourselves as far as we could under the tree, we were getting wet and cold. Jerome started shivering. This was bad. He's always way warmer than me. But he'd had his shirt off all day since we were using it to try and flag down boats, and he'd walked alot farther than me. We huddled together for warmth, but I was very worried at this point. We had nowhere else to go for shelter and if the rain kept up, we'd be very cold and tired. Jerome still thinking though, said we'd be able to drink the rainwater, which might help. The rain let up a little, and I felt my way back to the log where our goggles were to use them to catch the rain. Luckily they'd been face up, and had water in them already. So I brought it over to drink. Unfortunately, perhaps due to the plastic, or the defogger we used on them, it tasted terrible... So we hunkered back under the bush, and were both sitting quietly, and a bit despairedly, trying to figure out what to do next. Then from the other side of the island we heard the most amazing sound. A horn, it sounded exactly like the one from our boat! We jumped up despite the rain, and tried to head towards it. Then we heard Ollie's welcome voice calling our names! We yelled back as loud as we could. Jerome got around first, and they saw him! We were saved!! I went back and got all our gear together. I even paused to wonder if I should bring the coconut to eat later! When I got back to where the boat was, someone was on shore with Jerome, I didn't know who he was, but I gave him a big hug as soon as I got there. He was asking if we were okay and everything. We said yes, just very thirsty! He asked if we had shoes on, which luckily we did, the tied was out, and we'd have to walk out to the boat, but the bottom was covered in very spiny, very poisonous sea urchins. So by the light of his small headlamp, we took turns taking steps and carefully made our way to the boat. First we came to a tiny fishing boat, with a very excited local in it, who drove us out to a small speed boat. We found out later, that he was one of the fishermen, who we'd waved at all afternoon, and when our boat called the locals to see if they'd seen two people near the island, he'd said something to the effect of "oh yes, I've seen them. They're very friendly, they've been waving at me all day." But once they explained, he got in his boat right away to come find us. On the speedboat, we were greeted by a very very relieved Ollie, who gave us giant hugs, and appologized profusely, as well as two other crew from our boat who were equally relieved. Two others were on the boat who we didn't recognize. After ensuring we were okay, and giving us big water bottles, they started to head out. The boat ride back was quite treacherous. It was pouring rain, pitch black, the only lights were 4 handheld flashlights/headlamps, which were used to try and navigate through areas with pearl farms - with have nets that will ruin your engine, if you drive through them. We told our story to the people on the boat, who were a bit in disbelief, but happy we'd been smart and stayed put, and relieved we were okay, and that they'd found us right away. The two guys turned out to be Eddie and Jack - the founders of Tao. It took about an hour to get to the camp. We were greeted by the rest of the boat, who'd been waiting anxiously for the 3 hours since the speedboat had left, worrying about what was happening. We were taken to a sheltered area, giving big cups of lovely hot tea, and food. We told our story once again, and heard the otherside of the story too. We're not sure if they counted wrongly, or just forgot to count at the two spots, but they didn't realize we were missing when they crossed the channel. Once at base camp, which was quite big and spread out, our bed sheet bag (which we hoped would be the giveaway) had rolled onto the ground. It was almost 8:30, after dinner, when people were almost heading to bed, that one of the other couples mentioned to another that they hadn't seen us at dinner. The boat is quite big with lots of areas, and the camp was big, so they thought perhaps we were just around somewhere. They checked all the bed areas, and the camp, and then went to give the alert that they were sure we weren't there. From there the boat was prepped and they headed out as soon as they could get everything together. For the rest of the trip, the whole crew was extremely apologetic, and genuinely upset about what had happened. Everyone realized that our situation was the best possible outcome, but that things could've ended very differently. We discussed with them several suggestions for how to make the counting and keeping track of people a bit more air tight, so that it wouldn't happen again. They were going to pass on our suggestions to Eddie and Jack, and look into implementing some in the future. We hope to hear from Tao in the future to learn what they've decided to do. I know that our crew was so devastated, that they will be very unlikely to not triple count extra from now on, but we'd like to be assured that this is used as a learning experience for the whole company, so that in the future, it will never happen again. All in all, it was quite the experience! While it was pretty frightening at times, for the most part, we stayed very level-headed and logical I think, and worked together to do what we could to stay safe and calm, while having every trust that Ollie would come and find us as soon as he could. We were also lucky that nothing bad happened - apparently there are spitting cobras on the island! And we're very grateful the boat came when it did with the rain starting. While I wouldn't want to do it again - without several bottles of water and some matches at least - overall it was an experience of a lifetime, and I'm pretty sure it'll be a story that we'll be telling and re-telling for a long time to come! I mean really, how many people can say they were marooned on a deserted island! Damn! That is the craziest story! One for the ages!